I live in Spain, so GH or Alexa are as of right now out of the question (dammit Google and Amazon, get here quick!). But that doesn’t seem to play nice with ST… right? Correct me if I’m wrong! So the question I’m throwing at you guys… any news of any zwave or zigbee (trying to stay away from the word WiFI since the wife wants to stay away from it) that I could use in this situation? First of all, nothing bluetooth plays well with ST as there is no bluetooth radio in the hub. For bluetooth devices you need a “middleman” handler. But for speakers, you have to have something to receive the signal and therefore play it on the speaker. Think of the bluetooth speaker as an extension of your phone speaker. It’s your phone that’s playing the music. Spotify for example is not connected directly to your bluetooth speaker. Same concept here. So basically, if I have a raspberry pi 3 with bluetooth connected to the light-speaker combo… then all I got to do is add this app and I’m good to go? No…you have to follow the instructions within the post. Whatever device is connected to the bluetooth speaker has to be running a program that can receive the messages from ST. There are details within the post. Also, if you’re using RPi, you can just use the analog audio output…you don’t have to connect with BT. Plus, regular speakers use less juice. Although, I am slightly confused why you’re using this as an Alarm Clock solution…if ST or power is down, it will completely fail. Alarm Clock functions is one of those things that I need to not fail. That’s one of the reasons I’ve not brought them into the ST universe yet. But that’s just me personally. I’ve had the luck to have ST fall when I don’t really need it… or when I’m sleeping… but it always comes back up before I need it! so no worries there! @danielccm why cant you use Alexa in Spain? Can you not order off Amazon Germany or UK? Seems like eventually an outage time will overlap with the time the alarm clock was supposed to go off. why cant you use Alexa in Spain? Can you not order off Amazon Germany or UK? A) hadn’t thought of that option! B) I’d actually rather go with GH… lol! always choosing the hard path to travel! Or maybe ST will be fully stable by that time! lol! 9, does that matter? lol! I would say it does. If the alarm clock fails miserably due to a ST platform issue, then it’s really not that big a deal if she doesn’t wake up on time. Much different than if an adult were going to rely on ST to wake him or herself up to get to work on time at a hospital, for example. It might, for several reasons. First, as @marktheknife mentioned, reliability probably isn’t as big an option as it would be for an adult. Second, several studies have shown many kids tend to be more sensitive to light rather than sound. ( this is why so many parents wake up the kids by opening the curtains, even if the parents don’t know why they’re doing that.) They’ll even sleep through smoke alarms. If you have a hue bridge, you might want to just try their “wake with Light” option. It’s a good one. Third, if she has a smart phone, there are lots of alarm clock apps to choose from. But I’m assuming that at nine she probably doesn’t. 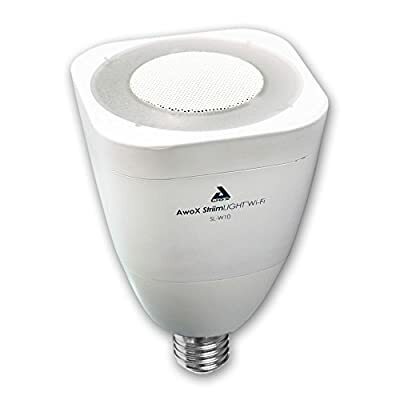 It's an LED-Energy-saving-lamp with integratet W-Lan-Speaker with remote control. If you have a hue bridge, you might want to just try their “wake with Light” option. It’s a good one. You could setup firewall rules with your router to restrict your kids’ internet access at night but not yours (or any IoT devices that depend on WiFi). Unless of course your wife worries that it’s you that stays up too late on the internet, not your kids . The worries are more radio interference/contamination related! As in, what effects does WiFi have over kids or adults? Turn off all the lights on the router and pretend it is off ? I know, I know… a wee bit risky to counter command " She who must be obeyed" but… it might work ??? Just tell her… wifi is cheap… good husbands are rare and hard to come by. .